There’s something absolutely giddy making about getting a bunch of new, nice looking dice. I’ve always felt a bit deprived in the dice-quantity side of things. Typically I buy a single poly set at a time every couple of years, but not this time. 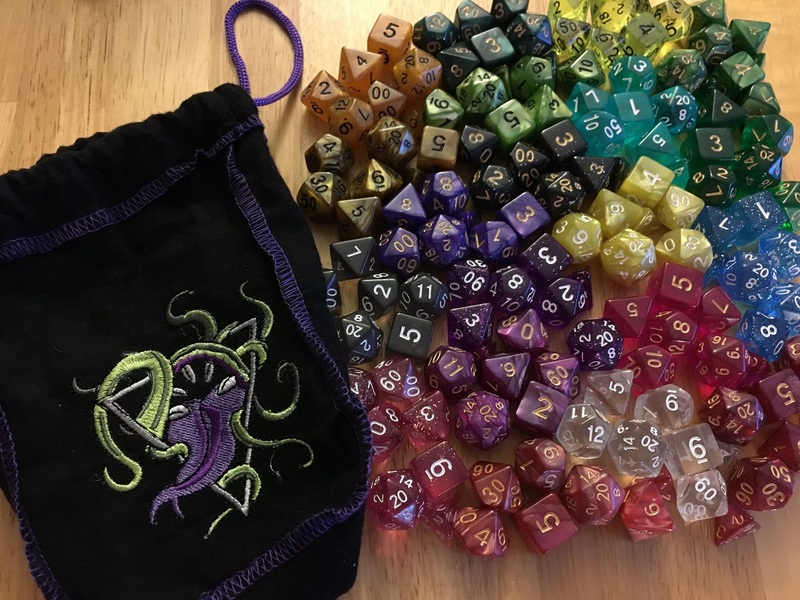 I’d been coveting the Wiz Dice Bag of Devouring on Amazon that comes with “140 Polyhedral Dice in 20 Guaranteed Complete Sets” for a while now and finally gave into temptation. There’s also a Wiz Dice Bag of Holding, but that one had less of the cool marbled and swirly types and more solids and translucent sets. And the bag that comes with the dice is fun, too. And yes, of course I had to separate them all out, group each set, and admire each one. Does everyone do this or just me? 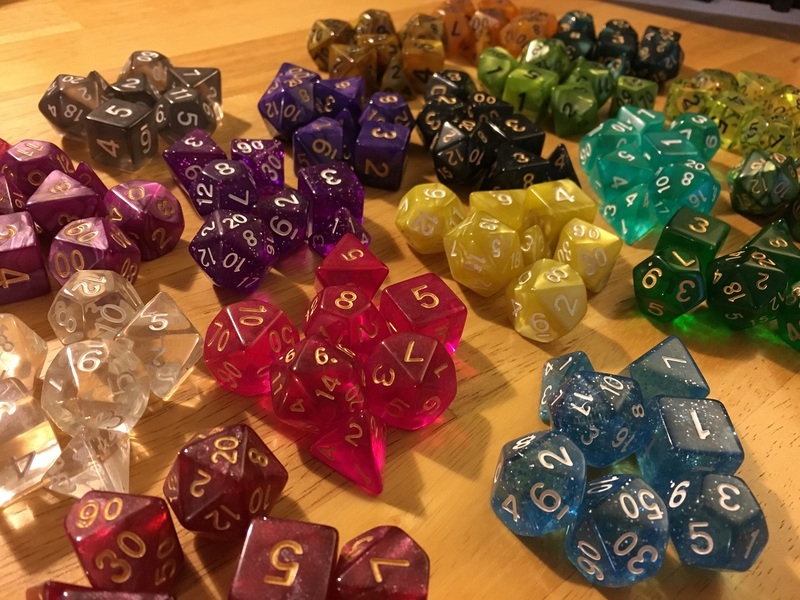 Anyway, I’m very please to have all these new swirly and shiny dice. With great ceremony the new dice were introduced to the veteran dice of many a past epic battle and perhaps some not-so-epic moments. The hardest part is figuring out which dice to put in my GM dice box and which ones to I’d use as a player. I’m not really a superstitious sort, but I’m absolutely positive that GM mojo will curse any dice if I try to use them as a player. Heck. I even have a hard time sharing my dice because of other people getting their potentially bad luck all over my dice. That stuff is SO difficult to get off! The D&D 3.5 Eberron game that I’ve been a player in for the past 4 years is on hiatus, which means there’s no real idea of when or if that will start up again. 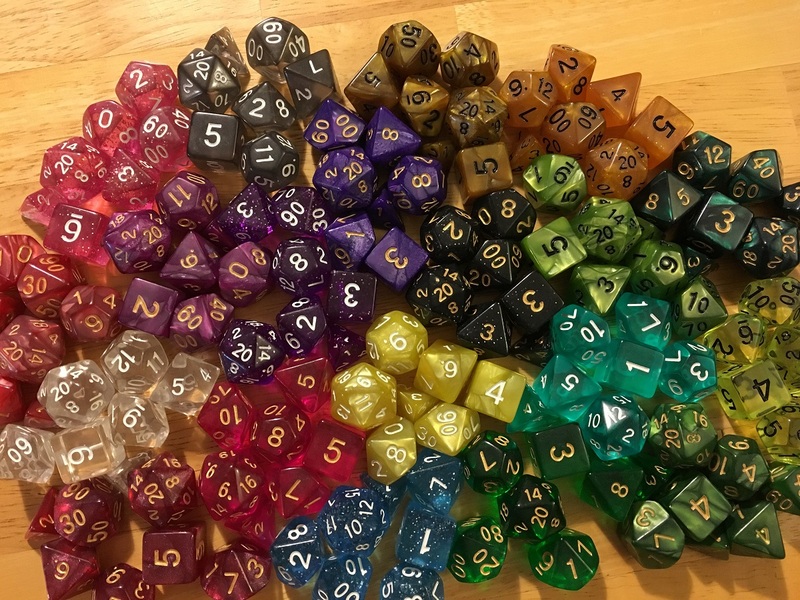 So if I pull some of those new dice aside to be my player dice, who knows how long it will be before I get to fondle and toss them in a game session!